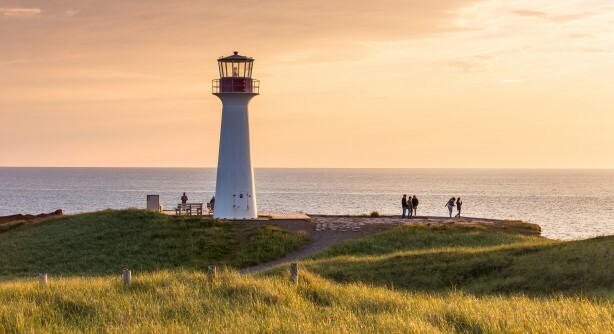 Lighthouses are iconic features of Les Îles and they represent a considerable heritage value. There are six working lighthouses on Les Îles de la Madeleine. Except for those on Brion Island and on Rocher aux Oiseaux, they are all easily accessible. The lighthouses are a testimony to the history of navigation in the Gulf of St. Lawrence and to the lifestyle that came with it. In addition to being aids to navigation, the lighthouses are reference points for fishers and pleasure boaters. As well, they are indicators of the location of their respective village. Between 500 and 1000 shipwrecks were recorded through the years in the vicinity of the archipelago. The symbolic value of the lighthouses as virtual guides and beacons of light is ever present in the collective imagination. They are a part of the history of Îles de la Madeleine and they are dear to the hearts of Madelinots. The first lighthouses were built in the early 1870s. Between 1870 and 1874, to improve navigation safety in the Gulf of St. Lawrence and to help prevent shipwrecks, the Marine and Fisheries Department of Canada built four lighthouses on Les Îles: Anse-à-la-Cabane (1870-1871), Bird Rock (1870), Entry Island (1874) and Borgot (1874). In those days, some of the lighthouses were surrounded by various constructions, such as the house of the keeper (who was in charge of the maintenance of the structure), the fuel depot and other buildings. A second phase got under way in 1904 with the construction of the lighthouse on Brion Island. Two more lighthouses, one on Brion Island and one at Cape Shea were built, in 1905 and 1911 respectively. Also part of this phase, were the lighthouses at Havre-Aubert (1911) and Cape Alright (1928). These additions provided a new impetus to Les Îles de la Madeleine. Some of them no longer exist. Automation of the lighthouses was undertaken by the Government of Canada during the 1970s. A full-time keeper was no longer needed and several keepers' houses were demolished.